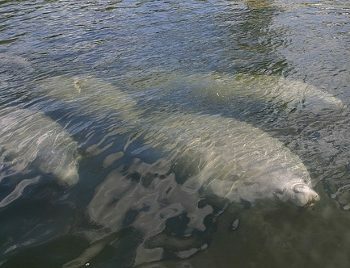 ORLANDO, Florida – Two 22-year-old men were sentenced in Federal Court today for harassing a mother manatee and her calf in a canal behind a home in Cocoa Beach, Florida. The United States Attorney said that Taylor Blake Martin of Alabama and Seth Andrew Stephenson of Rockledge, Florida were sentenced today by U.S. Magistrate Judge Gregory J. Kelly. Martin and Stephenson previously pleaded guilty to harassing an endangered species. Judge Kelly ordered Martin to pay a $3,000 fine, and sentenced him to 175 hours of community service, and 2 years’ probation. Stephenson was ordered to pay a $2,000 fine, and was sentenced to 175 hours of community service, and 2 years’ probation. Martin and Stephenson were also ordered to individually post an apology and a statement of remorse on Facebook. According to court documents, the U.S. Fish and Wildlife Service became aware of a video posted on Facebook that showed one individual luring two manatees to a dock with a water hose and another individual jump off of a boat dock and “cannonball” an adult manatee and a calf. Further investigation revealed that Martin was the person who “cannonballed” on top of the manatees and Stephenson lured the manatees to the dock with the water hose. The video shows Martin land on the back of the adult manatee as the manatees swim away. Stephenson then begins to use the water hose in an attempt to lure the manatees back as the video ends. "The U.S. Magistrate Judge sent a clear message with this sentence that manatee harassment is a serious crime which will be dealt with harshly," said Andrew Alois, Resident Agent in Charge for the U.S. Fish and Wildlife Service in Florida. "If there had been evidence of physical damage to the manatees he would have put them in jail,"
Manatees are protected under the Endangered Species Act and the Marine Mammal Protection Act. They are found in marine, estuarine and freshwater environments. The canals in Cocoa Beach and the surrounding islands, known as the Thousands Islands, are designated as a "Brevard County Manatee Protection Zone" under the Florida Manatee Sanctuary Act. There have been several reported instances of people harassing Florida Manatees in recent years. A Fort Pierce, Florida man was arrested for allegedly harassing or disturbing a manatee calf in Taylor Creek in St. Lucie County back in in January after photos of him hugging the sea cow were posted on Facebook. In September 2012, a woman was photographed riding a manatee at Fort DeSoto Park in Pinellas County, Florida. The woman contacted the Pinellas County Sheriff's department after the photos made the news, but was not immediately arrested because authorities said it was an arrestable offense since the manatee harassment did not occur in a deputy’s presence. She was later arrested and charged in November 2012. There are also recent instances of people helping marine animals in Cocoa Beach. Last, a Florida surfer rescued a sea turtle that was tangled in fishing line. In May, a Florida lifeguard saved a shark by pulling back out to sea with his bare hands. Target Criticized For Describing Plus-Size Dress As "Manatee Grey"